Three hundred and sixty five beautiful beaches, one for everyday of the year, is how Antigua is described. Christopher Columbus, the first European to visit the Island, named it Antigua pronounced “An Tee Ga” after an icon in a cathedral in Seville, Spain in 1493. The Caribbean Islands located in the West Indies are part of what is known as the Leeward Islands. Antigua was also known as “Waladli” so named by her early inhabitants. In 1632 a group of Englishmen established the first permanent European settlement on the island. Located on major sailing routes, Antigua was considered to be Britain’s “Gateway to the Caribbean.” Sugar became Antigua’s main crop and regrettably with it, came slavery. Barbuda, has been intimately tied to Antigua and is a small island just 30 miles due north. She has very few inhabitants and is a home to a frigate bird sanctuary, the national bird. Barbuda is known for its pink and white sandy beaches, abundance of ship wrecks and beautiful reefs. During the days of cultivating sugar, this island was leased to the Codrington family. It was used to grow food and to house additional slaves for the sugar plantations on Antigua. Antigua and Barbuda gained their independence from England in 1981. 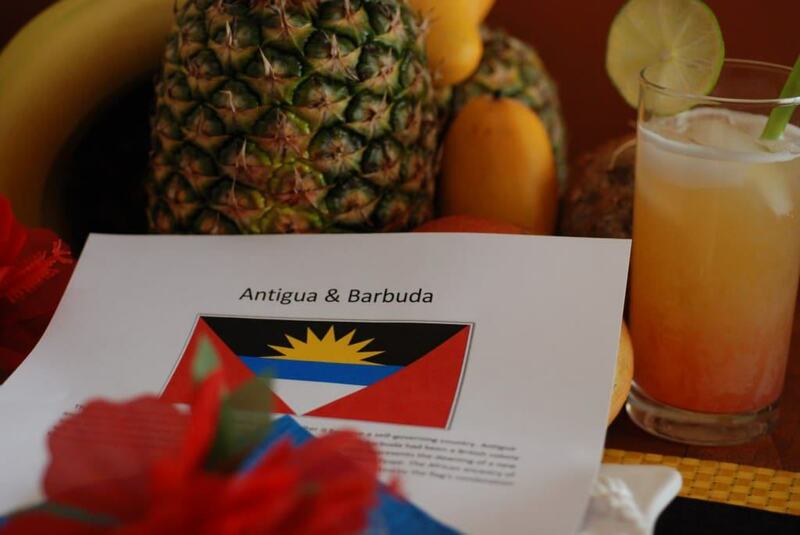 Together Antigua and Barbuda are considered a dual nation. Standard English is the official language, however Antiguan Creole, a hybrid of West African languages mixed with English is also spoken. Today 91% of Antigua’s residents trace their roots to Africa, others are British, Portuguese, Lebanese and Syrian. This nation is even smaller than Andorra, measuring 108 sq miles and inhabited by only 80,000 people. As the majority of Antigua’s land was used to grow sugar, food was imported from the Americas and Britain. The main influence on the cuisine came from the ancestry of her people as well as her occupiers, bringing some creole specialties to the islands. Antigua’s African influence is evidenced in their national dish called fungie, (pronounced “foon-jee”) a porridge made from corn flour. The pepper pot, called Tomali ((Toma means sauce, and ali a clay pot) is also a traditional dish which is a thick stew flavored with salted meats, peppers, spinach, squash, peas and okra. The early islanders would also throw any other “protein of the day” (including a rodent called Agouti) into the mix and cook the pot on a fire for days. Other popular dishes include ducana, a sweet potato dumpling wrapped in banana leaves, macaroni pie, salt-fish, seasoned rice and of course the abundant local seafood. The Arawaks, early dwellers of the island, get credit for introducing Antigua’s most popular fruit, the Black Pineapple. It is said to be the sweetest you have ever tasted. Today you can find pineapple crops throughout the islands. For our meal, in the interest of full disclosure, I must say that I originally prepared salt-fish and ducana for this journey but I was not happy with my results. I decided I could not leave this beautiful place with a less than deserving meal. So I hunted for additional recipes and came up with a fantastic new meal. (I hope you agree.) Please know that I am in no way suggesting that salt-fish and ducana are not wonderful dishes, I was just not satisfied with my attempt to make them. I would love for anyone of you to share your experience with Antiguan dishes with me as well. There is something about the Caribbean beat of calypso, steel band and reggae that instantly puts a smile on my face and a spring in my step. 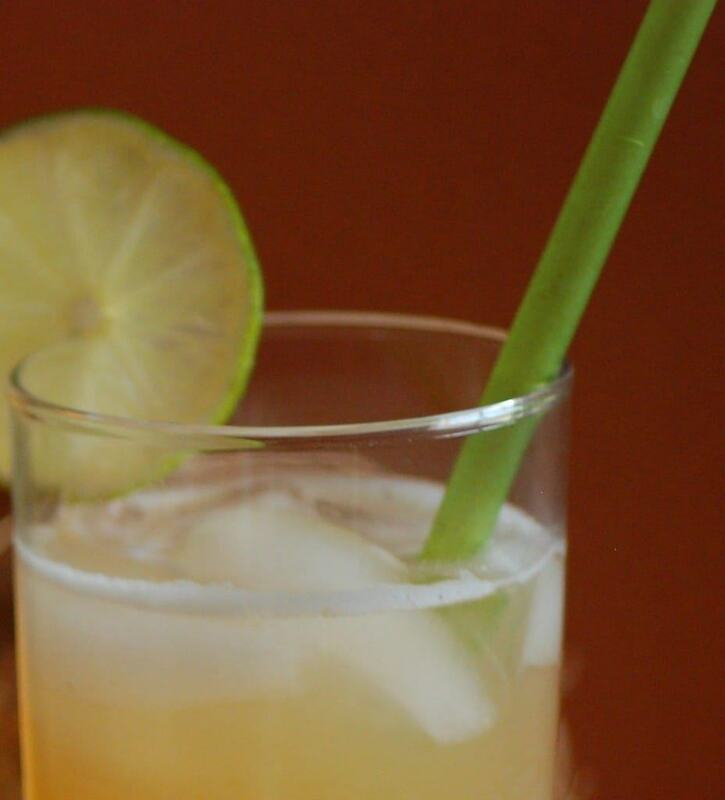 Add a nice rum punch and one can’t help but feel the rhythmic spirit of Antigua while preparing their cuisine. I set the table using tropical fruits for our centerpiece, as they influenced every dish on our menu. We started off with the pineapple salad, in honor of their sweet black pineapple. 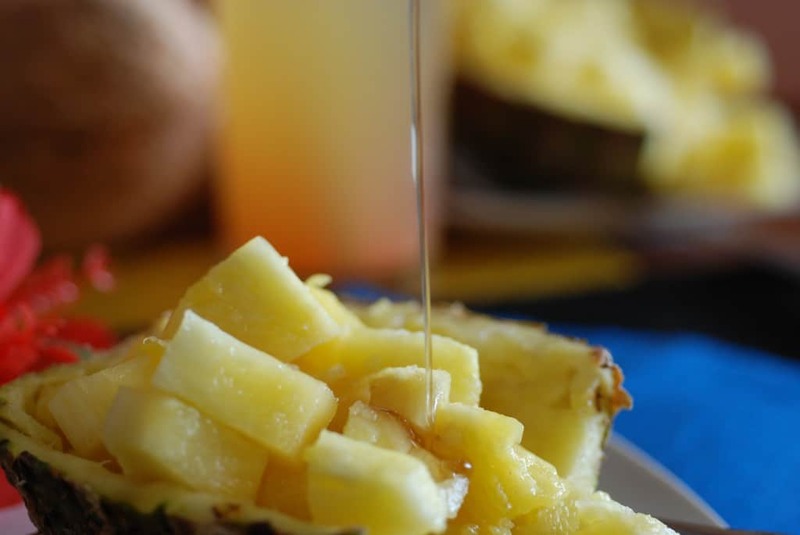 Ours was served in a pineapple boat and drizzled with a mixture of honey and rum; it was succulent and delicious. For the entree, a local fish, red snapper, was used to make the kabobs. It was marinated in yogurt with mango for just a brief time, then onto the skewer with mango and onion chunks. Our kabobs were placed on a hot grill for a few minutes per side. 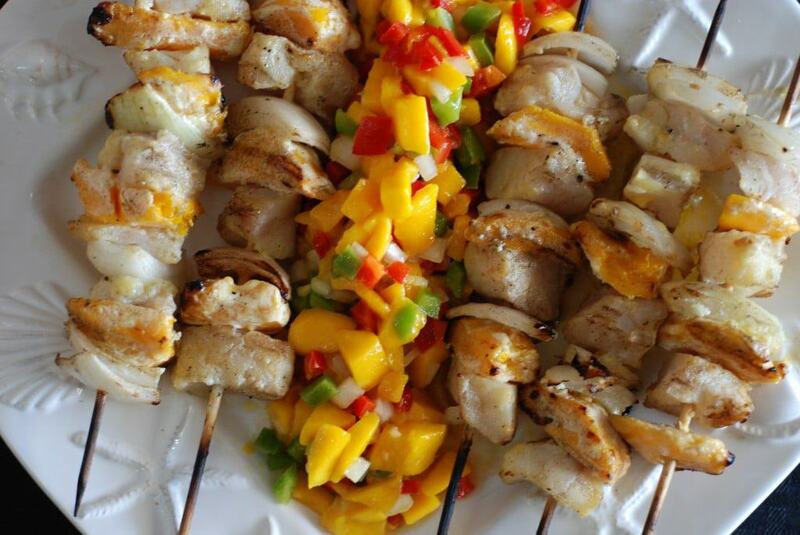 Once cooked to a perfect tenderness, the kabobs were served with an unbelievable mango and red pepper salsa. The sweet and tart contrast in the salsa was surprisingly refreshing. 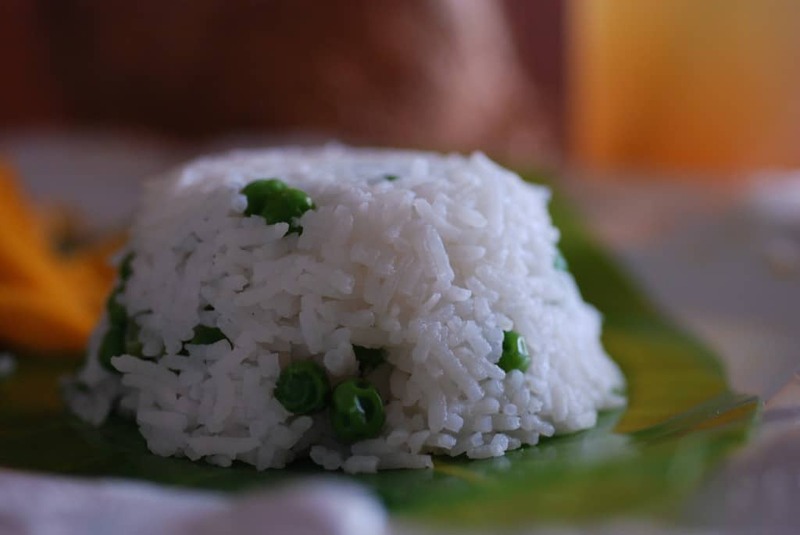 Along side the kabobs we enjoyed coconut rice with young English peas. 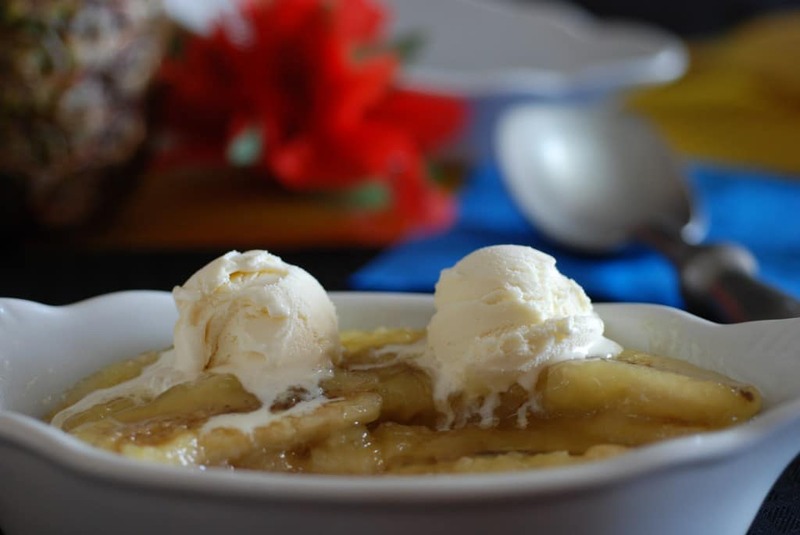 Our grand finale was dessert; banana flambe’, served with a rich vanilla ice cream… need I say more?